This is our method of producing applesauce. You can make as little or as much as you like. We wash and quarter the apples, taking out the seeds but leaving the skin. The skin contains the natural pectin that will thicken the sauce. We use our seconds for sauce so we do take out any bad spots from the apples. Place the apples in a saucepan and add a very little amount of water. Cook the apples, stirring as necessary to prevent sticking. We put the mixture through a food mill to remove the skins and any seeds. Wait until the sauce cools before deciding if any extra sugar is needed. We don’t add any extra sugar to our sauce. We often use a mixture of apples. 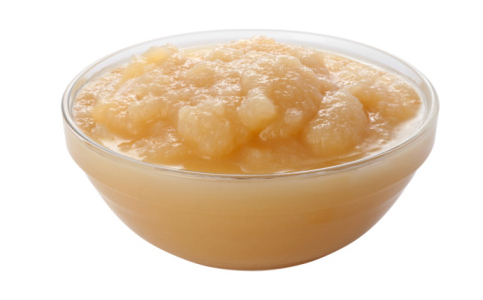 Golden Delicious apples used alone makes a lighter colored sauce. We prefer freezing the sauce using canning jars that are freezer safe. We have canned sauce using the hot water bath method.